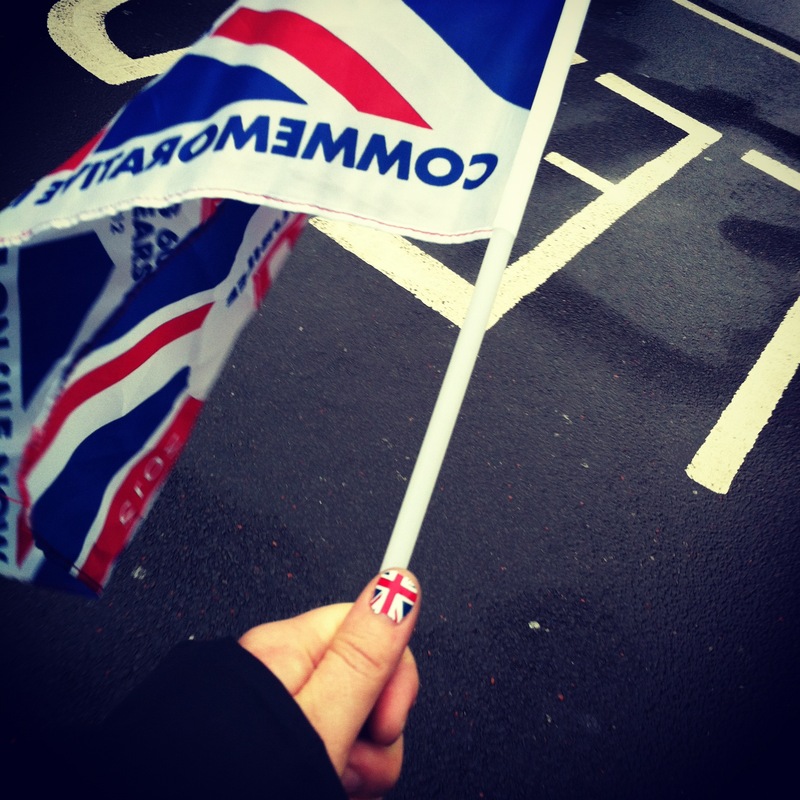 Well, the Queen’s Diamond Jubilee was quite the celebration, but befitting the British cliche, it rained the whole time. Not a lot. 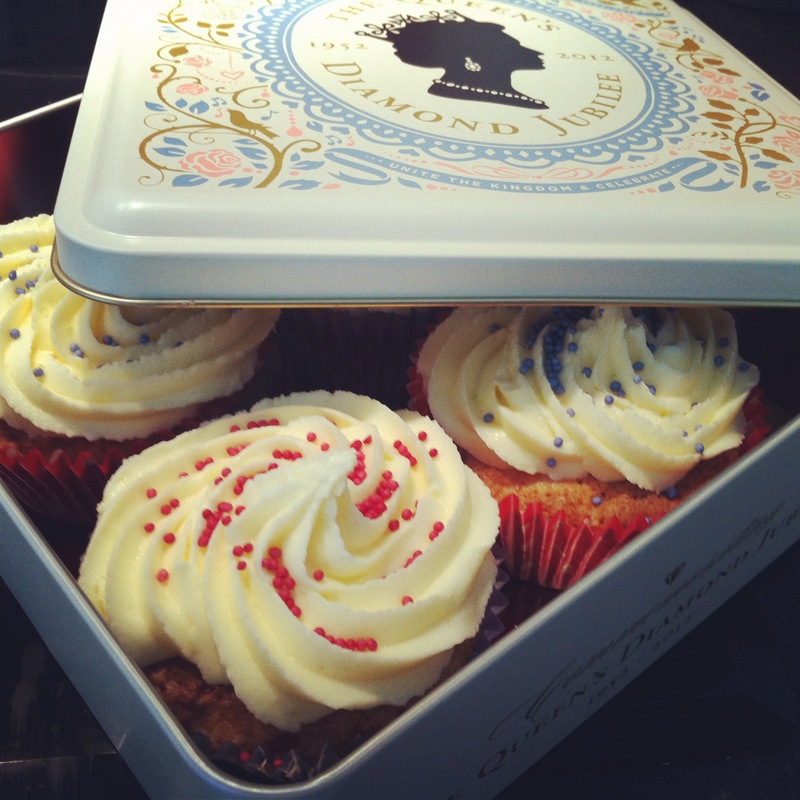 But it was an overcast weekend with drizzle, meaning we had to have our Jubilee party in VC’s apartment. It was probably just as well really, as the common wasn’t the riot of revelers we’d expected. OK, so the weekend was off to a shaky start. But we got things underway with a giant pitcher of Pimm’s punch which involves Pimm’s, lemonade, mint, strawberries, orange and cucumber slices. We laid the table with our picnic treats. Mum bought along some sausage rolls, asparagus rolls and some sandwiches. VC made egg salad sandwiches and her flatmate A made Coronation chicken for more sandwiches. 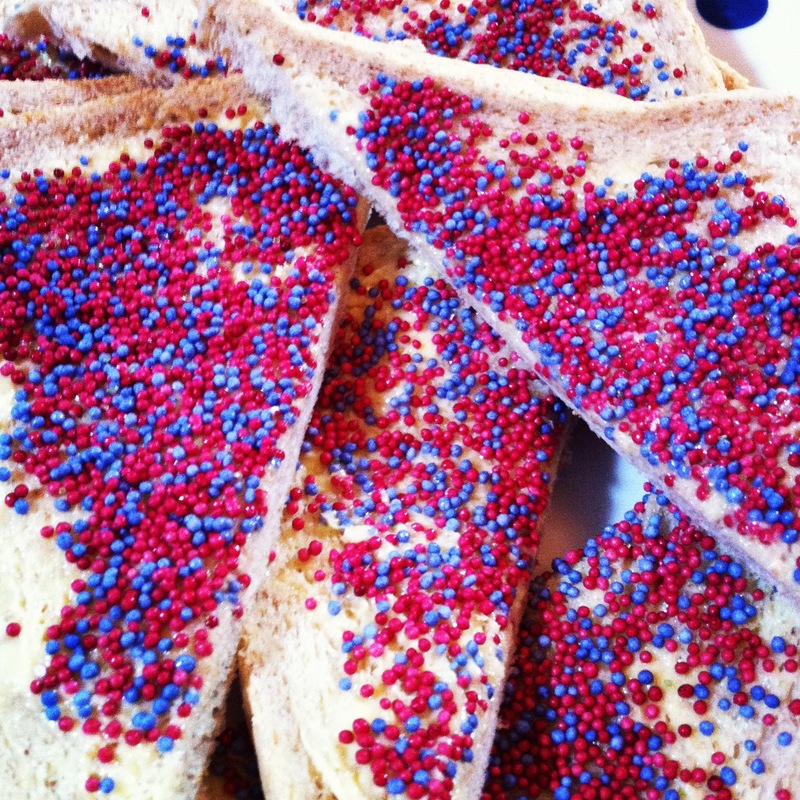 We made some fairy bread for the kids with blue and red sprinkles on white bread and I made a few Jubilee cupcakes for them too. I assembled the gigantic 4 layered sponge cake I’d been preparing since earlier that week. After a few tries, I found the perfect – and EASY – sponge recipe. Putting it together was fairly straightforward. In between layers of sponge I put whipped cream sweetened with vanilla and icing sugar and slices of strawberries, blueberries and raspberries. Four layers later I topped the whole thing, as you can see, with cream and berries in the colours of the Union Jack. Perfectly British. I had to put cream on the outside of the whole cake because the layers looked messy. I had to trim some down as my sponge cakes were less than perfect, and a little deflated the next day, but still they held up well and retained their light, fluffy sponge-like quality. After our party, Mum took the boys down to Rye for the weekend and I stayed in London with the gang. The next day we headed into Chelsea for the Flotilla. We walked the sealed off streets of Battersea with thousands of people ready to enjoy the day’s river parade. We flew our free flags and enjoyed the feeling of walking through normally busy streets and made our way across the bustling Chelsea Bridge. We waited with thousands of others along the river bank, waiting for the Queen to sail past. Jumping up and down between the cracks in the thick crowd, I managed to see the Queen’s barge cruise by, bedecked with red roses and red velvet. It was quite special. I enjoyed the boats with orchestras on them, playing English favourites like Rule Britannia. Even more, I enjoyed the crowd singing folk songs and anthems. There was a wonderful air of unity and joy I was so glad I went. Even if I didn’t get to see much. We enjoyed a few pints and chips at the pub down the road, sharing the high spirits of a celebration that has been anticipated for months. That was the extent of my event participation for the weekend. I joined the boys down at mum’s place for the rest of the weekend. I did watch the concert at Buckingham Palace and the wave on the balcony from Her Majesty on the TV. The fly by with the coloured smoke and the soldier’s salute were amazing – even on TV. The Brits really do know how to mark significant occasions. 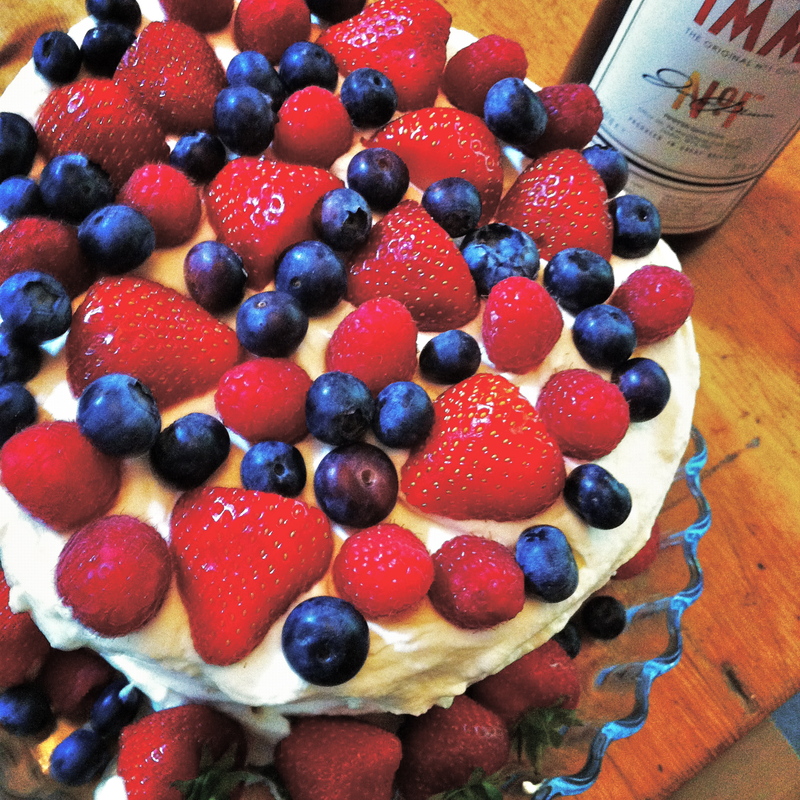 So without further ado, I present the recipe for my Jubilee sponge…courtesy of the Edmonds Cookery Book. Beat the egg whites and salt till stiff. Gradually add the sugar till dissolved. Add the yolks and mix till combined. Sift remaining ingredients into the bowl and fold in gently with a large metal spoon. Pour into a greased and lined cake tin and bake till golden…about 20 minutes. Leave in the tin for ten minutes, then turn out to cool on a rack.